Each Saturday between April 6th and October 5th, 2019, fire department crews will be out in Arlington County and City of Falls Church neighborhoods knocking on doors offering to do home safety checks, check your smoke alarms and even install free smoke alarms if needed. Our goal is to reduce the number of civilian injuries and fatalities due to fires by ensuring residents have working smoke alarms. While we provide free smoke alarm installations in the common areas of homes with no working smoke alarms, we encourage all residents to purchase and install additional smoke alarms in every bedroom. Test all smoke alarms once a month by pressing the “test” button. Change the batteries in your alarms at least twice a year, when you change your clocks for daylight savings time, unless your alarms are equipped with a 10-year lithium battery. Vacuum your smoke alarms regularly to remove dust. 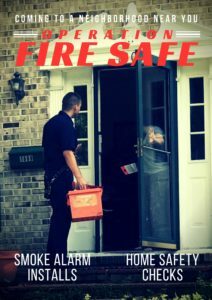 Smoke alarms are only one part of a complete home fire safety program. Fire is fast and smoke is deadly. During a fire, you may have only a couple of minutes to get out of your home. A fast and safe escape depends on creating and practicing a home fire escape plan. Staying low to the ground or crawling underneath the toxic smoke. Checking a door for heat before exiting a room and closing the door behind you. Locating an outdoor family meeting place, prior to an emergency. Calling 9-1-1 once outside of the home, and waiting for firefighters to arrive. If there are people in your home that need assistance evacuating, that must be included in your home fire escape plan. Young children may not awake to the sound of a smoke alarm alone. Practice your home fire escape plan with everyone in you home at least once a year. If you have additional questions please check out our pages on fire safety or smoke alarms, or call our Fire Prevention Office at 703-228-4644.